Can I interrupt my usual fare for a bit of nerdish pleading? 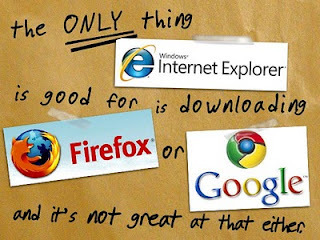 According to the Google Analytics for this blog, 44% of you are using Internet Explorer. Forty-four percent! 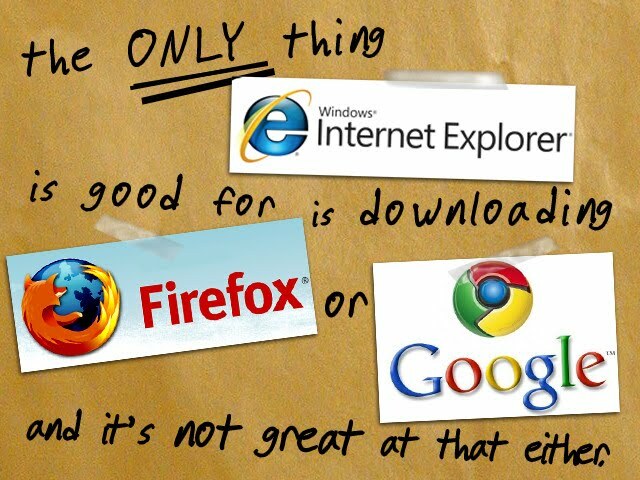 Allow me to share my thoughts on Internet Explorer. Trust me, peeps, once you go Firefox, you'll never go back. Also, for the 73% of you who are using Windows, I'd like to recommend Ubuntu. You don't have to be a Mac or a PC. Okay, I'm done geeking out. Thanks for listening. ... Or rather, your opinion on my blog. I put a little poll on my sidebar. I'm considering throwing in more personal, not necessarily adoption-related content but I'm not sure how I feel about it. Let me know what you think! I included the last option for those of you who are just a little click-happy. No, not my birthday, although that's coming up soon enough. I'm talking about something that other people are excited about, too. That's right, it's time for the Families Supporting Adoption Southwest Regional Conference. And it's happening right here in the unseasonably warm state of Arizona, in the very same building I go to every Tuesday night for Institute. It promises to be an amazing conference. Andrea has been working day and night and every time in between (4am, anyone?) to make it great. Check out the conference website and sign yourself up. You might notice a familiar name or two on the presenters page. How I ended up on the list with the likes of Mrs R, Kerstin Daynes and the always awesome Tamra Hyde is beyond me, but there I am. What are you waiting for? Go and sign up! Thursday morning I got to do another round of school presentations - three classes in a row, starting at 7:50am. I am not precisely what you would call a morning person. If I'm awake at 5am, I'm more likely to still be awake than I am to have just awoken. But I love doing school presentations, so I woke myself up, made myself presentable, and headed out. I took the 60. Why did I take the 60? The 60 is almost always a bad idea. But Google Maps told me the 60 would save me six minutes over the 202, and I live much closer to the 60 than the 202. In the end I was only five or so minutes late, but I could have done without the stress of stop-and-go traffic (mostly stop) and having to repeat to myself, "It's okay, my brakes worked, I'm not dead yet." This was my first school presentation in several months and I felt a bit rusty. I think I did okay, though. Well, actually, I think I did terrible, but I always think I've done a terrible job. It's so hard to tell with teenagers. You don't get much of a response from them. It doesn't seem to matter what you say; they just sit there and stare at you with bored looks on their faces. I feel like I need more feedback than that. I found myself mentioning irrelevant or unimportant parts of my story just for comedic effect. I got a few perfunctory laughs for them, at least. After I talked, there were a few minutes for questions. The first class was silent. I don't even know if it registered that I'd finished talking. The second class had no questions but a few comments. Three comments, in fact, all from girls. All of them said the same thing when Calli (the LDSFS caseworker) asked if anyone had any thoughts or experiences about adoption. "I could never do that." Have I mentioned before how much I loathe that phrase? I believe I have. And I do. Loathe it, that is. I don't believe there's a woman in the world who thinks they could do it. I sure as heck didn't think so. I said as much to the girls. I told them that when I'd heard about adoption before I was pregnant, I thought, I could never do that. But never say never, right? Because not only could I, but I did. When I spoke to the third class I changed up the conclusion to my story. I told them, "So many girls hear I'm a birth mom and say, 'I could never do that.' But I didn't think I could do it, either. No one does at first. What it comes down to isn't so much, 'I could never do that, it would be too hard for me,' but, 'I have to do it, because it's not about me.' Motherhood is about making hard choices and doing what's best for your child." This time, when Calli asked for comments, a girl in the back raised her hand. "I think that if I was pregnant and I didn't know what to do, I might think about adoption," she said. "I mean, I wouldn't want to or anything, but I think maybe if I was in that kind of situation I could think about it." I could have kissed her. I hope this young woman doesn't face an unplanned pregnancy. I hope none of the girls I spoke to ever has to, really. But odds are if this young woman doesn't, one of her friends will. And what she realized is all I ever want these teenagers to get out of a presentation - adoption is an option. It's not for everyone, maybe it's not for you, but it's an adoption. It's a possibility. It's worth looking into. Never say never. I never thought I could do it, either. I never thought I could place my precious little baby for adoption. But I did, and I am so glad! I hope that someday Roo will be glad I did, too. Here's another question (or rather, series of questions) I was asked via e-mail. As usual, I've paraphrased. Do you want to be an adoption advocate? Do you consider yourself one? 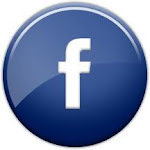 Do you feel a responsibility to educate people about adoption? This question made me wish I'd made it to Mrs R's adoption advocacy class at the FSA Conference in July. Unfortunately, I didn't see it on the schedule until after it was over. I don't know that I've ever applied that specific word to myself, but I suppose I am an adoption advocate. 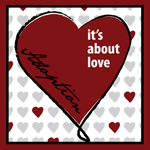 I mean, my blog is a pretty good indicator that I love adoption and want to spread the word. I've done birth mom panels and school presentations and that sort of thing. It was never a conscious decision on my part. It just felt, and feels, very natural to talk to people about adoption and my experience. I would love to continue doing just that. I want to do what I can, when I can, while I can. I do love presenting and blogging and talking about adoption. I've found it to be very healing. I didn't feel any particular responsibility until I started talking to people and I realized how many misconceptions there are. Knowing how many people have wrong ideas about adoption makes me want to shout to the world that it really is about love. I know that it's not my responsibility to change the way the world thinks. I'm more about taking it one person at a time. I hope to someday not have the time to worry about adoption anymore. My goal is to get married and have children of my own, and when that happens my focus will be on my own little family. I don't see dropping adoption all together then, but I (hope I) will have less time for it. I am proud to be a birth mother, but I don't want that to be my whole life. I'm totally okay being the adoption chick for now, but I hope to be more, to do more as my life goes on. If you've got a burning question for me, or one that maybe doesn't burn but just feels a little warm, e-mail me at thehappiestsad AT gmail DOT com, or click here: http://www.formspring.me/jilleb163. Usually, I'm the one who cuts and colors my mom's hair. I've got a cosmetology license, and I'm much cheaper than a salon. But for reasons that would take too long to explain here, my mother went to a salon in mid-June to have her hair done, and I tagged along. I got a million questions and comments and congratulations from the hairstylist, her co-worker, and other clients. It was refreshing and wonderful and made me very happy. I thought to myself that this must be what it’s like for pretty much any other pregnant woman. It was nice to feel normal for a change. My youngest brother finally spoke to me on the telephone. He told me that he and his wife were praying that I would make the right decision. This meant that to them, there was a wrong decision, which irritated me. I was having a baby. That was the right decision, end of story. I really wished people could have seen that. Owing to a combination of procrastination, fear, and defensiveness, I was due in two weeks and I hadn’t told any of my extended family that I was expecting (don't judge me). I wasn’t looking forward to their reactions. I fully expected everyone to pity my poor mother – first she lost her husband, now this. And I’ve always felt like a loser and a screw-up compared to other extended family members - not so much a black sheep, as a sick sheep who wasn't producing any wool. This wasn’t going to help. But my mom was going to visit my grandmother for her birthday, and I came along. I wasn’t sure what to say but I figured my belly would do the talking for me. There’s a line in the Genesis song “No Son of Mine” that goes, “I rang the bell with my heart in my mouth.” I never understood that line until I got out of the car in front of my grandma’s house. I closed the car door with my heart in my mouth. I felt a nausea unrelated to my pregnancy. I trailed my mother up the steps onto the patio. My mom gave my grandma a hug and went into the house. I bit my lip and gave my grandma a hug. “Hi, Grandma. Um, I’m pregnant,” I said. “Oh, no you’re not, honey, you’re just fat,” she said consolingly. Just a refresher, here’s what I looked like in mid-June. Fat? Just fat? I mean, I'm not a toothpick like most of my cousins, but really? Just fat? Again, she insisted that I just needed to diet. I was tempted to say, Well, that's news to me, because my doctor's done several ultrasounds and it sure looked to me like I was pregnant. Finally she seemed to believe me. And out came an edited version of the last year of my life. But my dear old grandma, ever the Midwestern stoic, took it all in stride. “These things happen,” she said, and she told me about a relative who’d become pregnant after a death in the family. I felt a little better. I don’t know why I was so nervous to begin with. This was, after all, the woman who, after my dad told her his cancer had returned and he was going to die soon, had sort of shrugged and then complained about her satellite dish. I really am a genetic mutant, I think, because I like to talk things out and feel my feelings, and my dad’s immediate family is very much the opposite. I love them dearly, I really do, but they tend to react to life-changing news by either shrugging or changing the subject. But it was good to get it out in the open finally, and good to see my grandma and talk to her. It had been months. And now that my grandma knew and would spread the word, my mother seemed to be more open to talking to people about it. She told one of her friends on the phone. Her friend was excited for me, which I thought was super nice. I wished more people were excited. Getting it out seemed to relax my mother, too. She seemed less tense, and less prone to snap at me. My brother came over to help put the crib together. He also gave me a priesthood blessing. I don’t think I could ever say enough about what an amazing brother I have. He should be given an award. I don’t think I could have gotten through my pregnancy without him. My last full month of pregnancy was ending quickly but I hadn't yet reached the point where I just wanted the baby out. I liked being pregnant. I liked feeling my baby kick. I liked knowing she was safe and healthy and happy. As long as my little girl was in my belly, I didn't have to do anything or make any decisions. I dreaded my pregnancy ending and life getting more complicated - and even then, I knew it would. I know I've blogged about this before, but I'm going to do it again because I think it's important. There is a great article *here* about things you shouldn't say to someone who has adopted. I love that I'm finding more and more articles like this. I honestly think that people ask such stupid questions because they simply don't know any better. Most people aren't trying to be malicious or rude. Of course, that doesn't make their questions any more appropriate. So I think it's fantastic that there are so many people out there who are making the effort to educate the masses. Adoption education FTW! I've written before about my necklace. I love my necklace. I still wear it every day. I still fidget with it when I'm feeling thoughtful or anxious or if I just need something for my fingers to do. I only wrote about the instance in Ireland, but I've actually had several people ask me about my necklace, or comment on it at least. I started a post almost two months ago about one such instance, but I never finished it. I meant to. But then I went to the FSA conference, and one of the classes I took was on who to tell, and when, and how. By tell, I mean, tell your adoption story. I was excited to take the class because of the time in Dublin when I explained my story so poorly. I was eager for any advice that I could get. And after the class, I felt empowered, and I thought to myself that I wasn't going to bother finishing the post, because the awkwardness I'd been writing about wasn't something to be repeated - I knew how to speak confidently about my story and my decision, and the next time it came up, I would look the person in the eye and tell them, with a smile, that I placed a baby for adoption a year ago. I've known myself as long as I can remember. I should know myself better than to think that an hour of "People take their cues from you" would keep me from making a cake of myself. I was with a group of friends (mostly guys) after a fireside tonight, and we were all sort of standing around and talking, the way that young people like to do when many of them are gathered in one place. I was shifting my weight from one foot to the other (because for me standing in high heels is more painful than walking in them), and had just become aware of a slight lull in the conversation when my friend T, who had been talking, caught sight of my necklace. I suppose when I shifted the light hit it just right for him to notice. "That's a pretty necklace" he said. It caught me off guard. I think that's part of the problem. After all, NOBODY expects the Spanish Inquisition. "Oh, thanks," I said. Please, please, please don't ask about it, I thought. T is a nice enough guy that I think he would be cool about things, but it wasn't just T listening - there were probably six other people listening. Five of them were men. What was I supposed to say if T asked? I did learn a thing or two at the class on talking about adoption, and so anymore, if it comes up, I will tell women a brief version of my story. Women feel safe to me. Even if they think I'm a dumb skank, they'll school their faces into polite smiles and pretend they like me just the same. But men? Men are much scarier. Men are unpredictable. Don't ask, don't ask, I thought. "Who's it for? Does it mean anything?" T asked. He seemed genuinely interested. And he is a genuinely nice guy. The truth was on the tip of my tongue. My audience seemed like nice enough people. I was thisclose to telling him ... except that another guy friend, D, was a few feet away, in another group of people. And before I could explain my necklace to T, I remembered what had happened with D.
I wrote about it in my scrapped post. I was talking to D and two female friends, one of whom happens to be a labor and delivery nurse - MY labor and delivery nurse. Small world, right? Anyway. My nurse friend mentioned something about epidurals, and without thinking I blurted out that the hardest part is holding still for it in the middle of a contraction. D and my other friend looked puzzled. "I had a baby last year, I don't know if you knew that," I said. D had a look on his face like a pig that knows it's dinner. "I did not know that," he said. And ever since then, for six weeks now, D has been distinctly awkward around me. He's a huge flirt, but he hasn't once flirted with me. The ease of our old conversations is gone. It doesn't seem to matter what I've done with my life in the past year, how much better I have become. It feels like D will never be able to get past the fact that I had a baby. All this flashed through my mind in about two seconds while I formulated a response to T's question. Does it mean anything? he'd asked. "Um, sort of. I mean, no." I blurted out. "What does the R stand for?" he persisted. I don't know what happened after that. I just ... I couldn't do it. "Nothing. It stands for nothing," I said. Liar! I thought. R is for Roo, sweet little Roo! T turned to A, the only other woman in the group. "Is she lying?" he asked. A shrugged. She didn't know. T questioned me with his eyes. "The R stands for Richard," I said, picking on a guy to my left. "We're secretly married." That got laughs out of a few people, and T said that if he were married, he wouldn't hide it, but that he wouldn't want to be married to Richard, because Richard is a man. The attention shifted, and I breathed a little easier. But only for a few seconds. Because once again, I've let myself - and Roo - down. And the more I think about it, the more I find that I WANT to tell T. Because he is such a nice guy. He'd probably say something like, "Oh, that's so cool!" and ask me maybe two questions, and then move on to something else. But I couldn't tell him. Because D seemed like such a nice guy, too, and now I think he thinks much less of me than before, and doesn't like me as much, and our friendship just isn't the same. I would hate it, absolutely hate it, if the same thing happened with T.
What on earth is wrong with me? Why can't I just say it? Why can't I just tell people the R stands for the name of someone I love very much. The person I love more than anyone else in the world. I wouldn't have to get detailed. I could even honorably dodge the question by saying the necklace was a gift from people I love dearly, and the R is one of their initials. Argh. I am angry with myself. I had a chance to promote adoption - to maybe change people's minds, or to at least open them - and I blew it. I made Roo out to be something shameful. Why did I do that? Why do I STILL do that? I am not ashamed of Roo, or my decision. I love the former and I'm proud of the latter. Why can't I just tell people? I wonder if it's too late. What if, next time I see T, I ask him if he still wants to know about my necklace? I could tell him, explain that I just didn't feel comfortable sharing it with everyone who was with us when he asked the first time. Would he understand? Or would my initial dishonesty keep shame as the most important thing? Will he understand why I didn't tell him when he asked? Or will he wonder why I didn't just tell him? My problem is, I think, that I just don't know how people are going to respond. My problem is that I know that most guys can't handle it. My problem is that even though people might mostly react based on how I tell them (they'll be cheerful if I am, etc), they've all still got prejudices, preconceived notions. I know I need to just let it go, but I think, the timing of being asked tonight was actually pretty good. The fireside that we'd been at was given by one of my church leaders, Elder Richard G Scott, and in his talk he had actually mentioned adoption specifically (I'm working on a post about it). So how perfect would that have been? I could have tied my story into what Elder Scott said about couples using adoption to find the spirits that were meant to join their families (it really was a beautiful talk, y'all should look it up - here's the *link*). But I let the chance pass me by, and now I don't know what to do. And I don't know if I'm ever going to be able to get past this fear I have that every man I meet is going to think less of me for having had a child. Today is a special day. Today marks one year since I placed my little Roo with her mommy and daddy! I cannot believe it's been a year already. But then ... I think, it's sort of like Roo's birthday felt. Like only a month had passed, and also like twenty years had passed. It's hard to say how much time it feels like it's been. I don't often revisit the things I wrote (and, by extension, the feelings I had) just after placement. It's too hard for me. But not for the reasons you might think. When I do read what I wrote, I feel a bit detached, as though what I'm reading about happened to someone else. I can still vaguely remember feeling that way, but it seems like so long ago. I just don't feel the need to go back to that time and relive those feelings. Sometimes I wish I'd been a bit less honest, a bit less forthcoming about how hard placement was. It can't have been easy for P and M to know the depth of my devastation. For their sake, I wish I'd kept my feelings a bit more private. Placement should be a happy time for new parents, and I hate the thought that I might have ruined some of that for them. But I try not to dwell on it. The past is past, what's done is done, cliché, cliché. Here's what's important: A year later, I am so much happier and more at peace than I ever could have imagined. I expected today to be a hard day, but so far it hasn't been. I got a nice e-mail from Roo's parents, I've done a bit of reading, a bit of laundry. I haven't cried yet. I might not. But it's okay if I do. It's funny, though. I cried a few days ago, in anticipation of today, but then, as always, I cried for myself. For how hard it was to place, to say goodbye to motherhood. I cried for the teeny-tiny newborn I cared for. I cried for Roo [insert my last name here]. I have never shed a tear for Roo [insert P's and M's last name here]. I cry for my baby. I don't cry for theirs. I cry for what might have been, not for what is. A year later, I would do it all over again in a heartbeat. Yes, it hurt. It hurt for a while. But time has dulled the pain, and continues to do so. Roo's happiness is worth every tear. If me being sad for a while is the price of her being happy forever, I'm glad to have paid it. I know I've probably got family members who think I should have placed sooner, with one of the couples I met when I was pregnant. But I couldn't have done. They weren't right. I was only able to place because I knew I'd found the right family. It was P and M or no one. I'm glad it was them. I'm glad they are Roo's parents. I hope today is a happy day for them - a day they celebrate being a family of four instead of three. Funnily enough, today's a pretty happy day for me, too. I feel alright. Mostly, I think. I mean, I feel a little sad when I remember this day a year ago - pre-placement, I should say. I remember how quickly the day seemed to pass - the fastest day of my life. I hardly put Roo down for a second, determined to spend as much of the day as I could with her in my arms because it was my last chance to do so as her mother. The hours slipped away and before I knew it, it was time to put Roo in the little dress I'd made for her when I was pregnant, brush her soft hair one last time, and strap her into her car seat for the last trip she'd make in it. The back of the car was loaded up with things to give to P and M, things I wasn't going to need anymore - formula, a few things from my baby shower, the last of the diapers. I dragged my feet, took a few last pictures, and finally knew, when I looked at the clock, that I couldn't postpone things anymore. I carried Roo in her seat to the car a final time, set the seat in the base gently and held the handle until I heard the click that meant Roo was secure. I walked around the car and got in the back seat with her. I stared at her the entire drive, trying desperately to memorize every bit of her. We got to the agency so quickly. The pace at which time had passed that day had never seemed more unfair as it did when we parked the car and I had to get out and take my baby inside the agency office. I don't remember placement as clearly as I ought to. I do but I don't. I wish we'd taken pictures together. I get so jealous when I see pictures from other placements. I get jealous of the professional photo shoots so many birth moms and adoptive couples seem to have done. I wish I'd thought to do something like that. I have a few pictures of me and my mom and Roo before P and M arrived, but none of all of us together. Well, now I've made myself a liar, because I cried when I was typing all that up, but it's okay. Because like I said, I feel sad for me. I feel sad at the thought of how hard that day was. I don't feel sad for Roo. She's had a great year by all accounts. Sometimes when I get e-mail and pictures of all the fun things Roo has done and the places she's been, I wish P and M could have adopted me, too (no offense, Mom). My little Roo has so many people who love her! She's so very blessed. Sometimes - not very often, for sanity's sake, but every now and then - I try to imagine what Roo's life would be life if I'd not chosen adoption. She would be loved, yes. But how hard things would be! I don't want her life to ever be hard. I know that being adopted doesn't guarantee that things will be perfect for her. But I know I've done all that I could to help, to give her the best start by finding P and M for her. Whatever happens now is meant to be, because she was meant to be theirs. And I was meant to be her birth mom. I'm so very thankful for that. I really do think today is a happy day. Roo is happy. Her family is happy. I think I'm going to be happy, too. I'll be back to blogging as usual tomorrow. 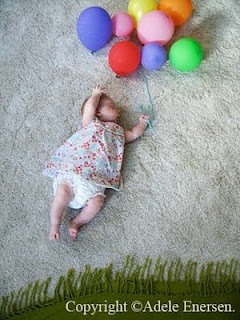 In the meantime, here's a blog I love dearly: Mila's Daydreams (click on the name). I don't know about the rest of you, but I've always wondered what babies dream about. This new mum has wondered, too, and she uses blankets and clothes and whatever else she has around the house to create the most incredible scenes from what she imagines her baby might be dreaming. Here's my favorite, called "Up." How amazing is that? My baby pictures look pretty lame by comparison. If I ever have children, I am totally going to steal this idea, although I doubt mine will look half as good. I've written before about things you shouldn't say to a birth mother. That's my area of expertise, so it's what I've had to talk about. But there's another side of things, too, and I think they're important to address as well. Because the fact is that couples who have adopted, or who hope to adopt, have plenty of stupid things said to them as well. There is an excellent article *here* about adoption, and at the end is a list of things that should NOT be said to an adoptive parent. I get irritated thinking that Roo's mama has to deal with people saying stupid things like these. Really irritated. Like, I wish I had names and addresses of people who have said these things to P and M, so I could ... I don't know. Push cream pies into faces, or give dirty looks (I should probably apologize for such violent imagery). I'm sure many of you could add to the list because of stupid or insensitive things that have been said to you. I know that most people don't mean to offend. They just don't know what to say - or rather, what not to say. How do y'all deal with the insensitive things people have said to you about adoption? Have any of you found any good ways to correct and educate people? Have y'all seen the movie Groundhog Day? It's one of my favorites. It's also about twenty years old so I'm not going to bother with a spoiler alert. On one of the days, Bill Murray's character Phil has gone a little cuckoo, and he steals the groundhog and drives off in a pickup truck. Phil the man is in the passenger's seat, with Phil the groundhog at the wheel. At one point, as the truck careens wildly, human Phil admonishes his furry driving companion, "Don't drive angry, Phil." There is a point to that recollection, I promise. And here it is. 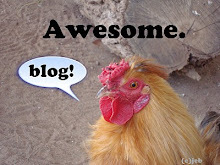 I have a blog rule I made after a few hasty, emotion-fueled posts: I don't blog angry. Or depressed. Or anxious. Or emotional. I type things out in Word (or rather, the OpenOffice equivalent), or as a draft in Blogger, and I come back to it when I've cooled off a bit. I don't always follow my rule to the letter, but I think I've gotten much better at it, and I think my blogging has improved as a result (although people do seem to better enjoy the really raw emotional stuff, which I reckon is just human nature). I broke my rule earlier. I was upset and my feelings were hurt, and I vented. I'm not proud of myself. My kneejerk reaction was an immature one, and I regret it. Kind blog readers, please forgive my emotional indulgence. I promise to whine less in the future.